Now that’s a mouthful, ain’t it? I was just out cleaning up the front yard garden (if one can even call it a garden at this point…I can’t believe how many weeds I’ve let sprout!) and while trimming the dead parts out of our purple butterfly bush, I spotted this little guy and knew it was a hummingbird moth (Debbi taught me about them a few years ago when we spotted one in the back yard). I grabbed my camera and got a few (mostly blurry shots—they’re not called hummingbirds for nothing). Here are the best shots I could get…you can barely see the “clearwings” because it was moving so fast. 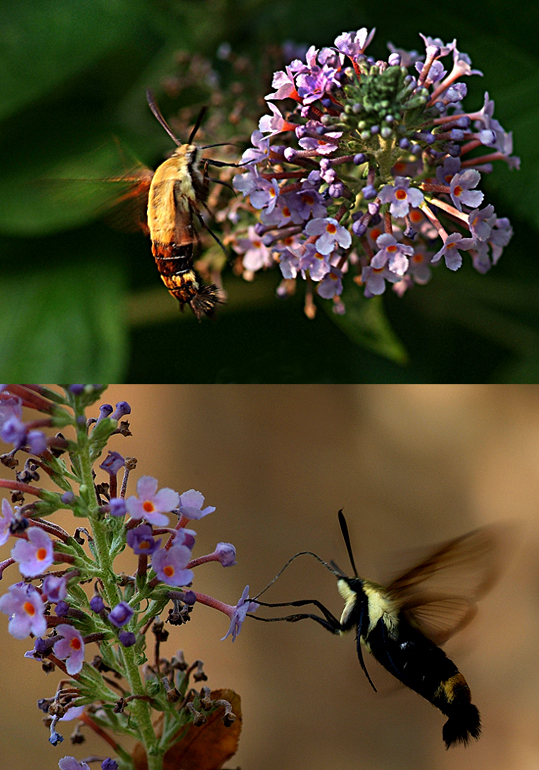 I identified it through several websites…the snowberry clearwing is the smallest of the hummingbird moths. Clearwing moths, the group to which the hummingbird and bumblebee mimics belong, lose the scales on their front wings after their first flight. Their wings resemble leaded stained glass with clear glass in the panels, much like a bee or wasp wing. The snowberry clearwing is often mistaken for a bumblebee. Not only does this clearwing have yellow and black bands, it also hovers and flits from flower to flower while sipping nectar. Adults fly throughout the day in open woodlands and fields, as well as in gardens and suburbs throughout the state, between late March and September. This bumblebee mimic is yellow with black wings and abdomen. At 1.25 to 2 inches, its wingspan is slightly smaller than that of the hummingbird clearwing. Its larvae feed on honeysuckle, dogbane and buckbrush. 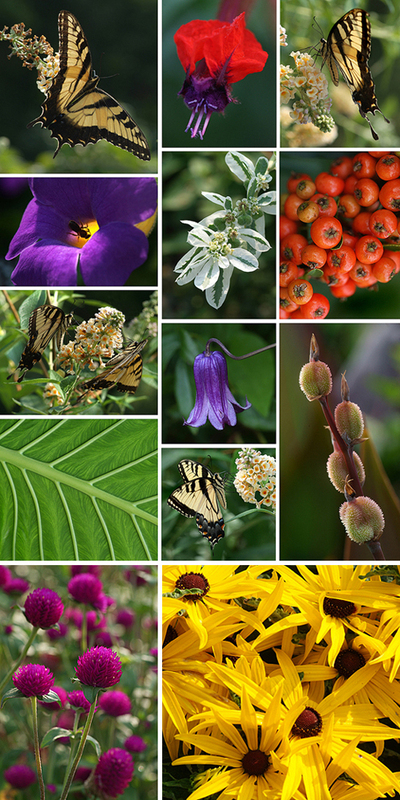 Adults eat from many flowers, including thistles, milkweed and lilac. © 2007 Cindy Dyer, All rights reserved. Sue stands in front of some wonderful sculptures at a studio on the way to Half Moon Bay…Sue eating apples (she claims she found on the ground) at Filoli (there are over 50 types of pears and apples growing in the Gardens)…Sue sits in “the big chair” outside the Napa Valley Visitors Center…Sue and Gina after dinner in Chinatown (we had Mexican food, if you can believe that)…in the second photo Sue looks excited and Gina’s going to sleep (too much studying! 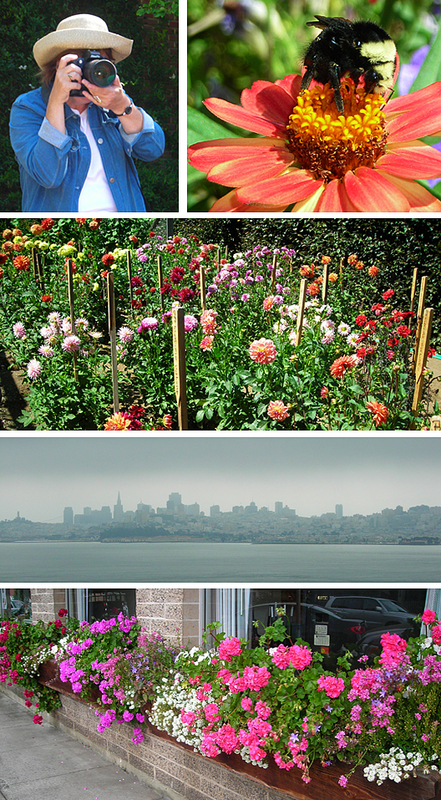 )…halfway between Filoli and Half Moon Bay, Sue spotted a family of eight deer grazing by the lake…Sue twirls in the grand ballroom at the Filoli estate…a recurring theme—watching our toes—the gull finds his feet as equally interesting as Sue does hers…while our gardens are waning, they’re growing begonias the size of salad plates in Half Moon Bay…Sue shows off her purchases in front of our cute (and fun to drive!) Jeep as we leave the Filoli Garden Gift Shop…Sue demonstrates how to wear sunglasses and map reading glasses simultaneously (most likely this is a Glamour don’t…where is my black cardboard swatch when I need it? )…Big portions and really great food at Big Joe’s Cafe in downtown Burlingame…CENTER: Sue hugs a very sharp metal elephant sculpture…Gina recovers from a day of studying and indulges in a bedtime bag of Trader Joe’s Pirate’s Booty popcorn…Sue almost fell into the basin at The Pulgas Water Temple at the Hetch Hetchy Waste Water Treatment Plant in Woodside, California. More information on The Pulgas below. Far away from the Bay Area and within the boundaries of Yosemite National Park lies the Tuolomne River watershed. Each year, in the springtime, when the Sierra snows begin to melt and feed the many streams flowing into the Grand Canyon of the Tuolomne, the water accumulates behind the O ’Shaughnessy Dam in the Hetch Hetchy Reservoir. Then, through a remarkable series of aqueducts, tunnels and powerhouses, the water is transported across the Central Valley and into Crystal Springs Reservoir, located just north of Woodside, to quench the thirst of the Bay Area. As a monument to this achievement, the Pulgas Water Temple serves to remind us of the precious nature of this resource. A variety of plants and trees (such as cottonwood, cotoneaster, and California coffeeberry) thrive in the well-tended grounds. A rectangular reflecting pool lined with cypress trees is an attractive accompaniment to the small columned temple. A quote from the Book of Isaiah (“I give waters in the wilderness and rivers in the desert to give drink to my people”) is inscribed on a plaque. Pulgas Water Temple was designed in the Beaux Arts style by William Merchant, a San Francisco architect trained by Bernard Maybeck. Merchant’s design featured fluted columns and Corinthian capitals to reflect the architecture of ancient Greeks and Romans, whose engineering methods were used to build the new water system. Artist and master stone carver Albert Bernasconi brought Merchant’s drawings to life. 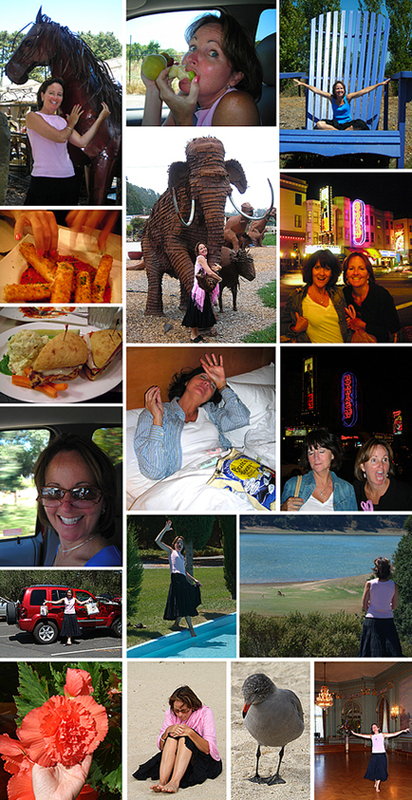 I armed Sue with my Nikon Coolpix camera while we were in California and let her go. Nice job on the closeup of the bee, by the way…didn’t think that little camera could focus that well up close. Well done, grasshopper! 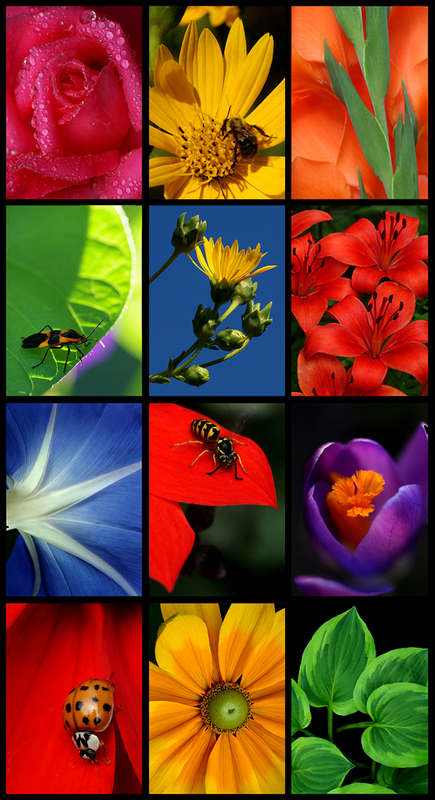 Jeff and I went to Green Spring Gardens earlier this morning to do some garden photography…as usual, the place was abuzz with bees and butterflies! Jeff has two photographs showing in the Green Spring Gardens Annual Juried Member Show (http://www.springfieldartguild.com/). One photograph is in the main building and the other is in the tea room house. Various watercolors, acrylics and oil paintings are also on display now (and the works are all for sale). The show runs from Aug. 28-Oct. 29. The bright red and purple flower (top, center) is a Cuphea llavea ‘Tiny Mice’ plant. Its common name, bat-faced cuphea, describes it perfectly. Since cupheas are a desert plant, you assume it would be drought tolerant. But this little beauty, in its native haunts, grows close to streams, requiring moist yet well-drained soil. Sue and I have discovered that you simply cannot tour the entire wine country region in half a day! We foolishly thought we could cover (quickly) both Napa Valley (http://www.napavalley.com/) and Sonoma Valley (http://www.sonomavalley.com/) in one day. (They looked much closer on the map!) Even with stopping only at two wineries, two olive oil companies, and a soap shop, we realized we were just scratching the surface of these two regions. And there are over 200 wineries in each region! We stopped at a few wineries—Sue’s wish list included CakeBread Winery in Napa (http://www.cakebread.com/) and Kendall-Jackson in Sonoma (http://www.kj.com/home.asp). We also discovered The Olive Press (http://www.theolivepress.com/), and St. Helena Olive Oil Co. (http://www.sholiveoil.com/) and, after sampling our way in and out of both places, we came away with several bottles of oils and basalmic vinegars. We discovered the Goat Rock House on Goat Rock State Beach just after we left Sonoma Valley. Goat Rock is near the mouth of the Russian River, and is known for its scenic shoreline. It is home to a colony of harbor seals (we didn’t see any) who make this area home during pupping season (March through August). We drove down to the beach and discovered this most peculiar gull (below). At first I thought he had a deformity on his beak (a tumor, perhaps), until I zoomed in with my longest telephoto lens and saw the dot pattern on the “legs” hanging out his beak. It was a starfish! And he was trying to swallow it whole. There were two other gulls nearby, just waiting for him to turn it loose. After I photographed him, I walked away and Sue observed him spitting out his lunch…so that confirmed that he didn’t have a facial malformity. He had just bit off more than he could chew, so to speak. We had dinner later (Mexican food, not sea stars) in Bodega Bay, and then headed over the Golden Gate Bridge.